Nov 20, 2018, Toronto, Ontario –Ethiopian Airlines Canada invited over 50 guests which included tour operators, travel consolidators and media to an up close and personal evening with Canadian celebrity Chef David Rocco at Toronto’s Oretta Restaurant. The savouring sweet aroma filled the air as Rocco prepared one of his Ethiopian inspired dishes. Charismatic and interactive, Rocco impressed guests as he shared stories about his trip to Africa and desire to go back. “What an incredible evening! We were so pleased to host this event and to have someone like David Rocco provide such incredible footage through his Dolce Africa series. He really embraced the culture using his culinary expertise to bring food and travel to audiences in such a unique way. ” said Nigusu Worku Ethiopian Airlines Regional Director. 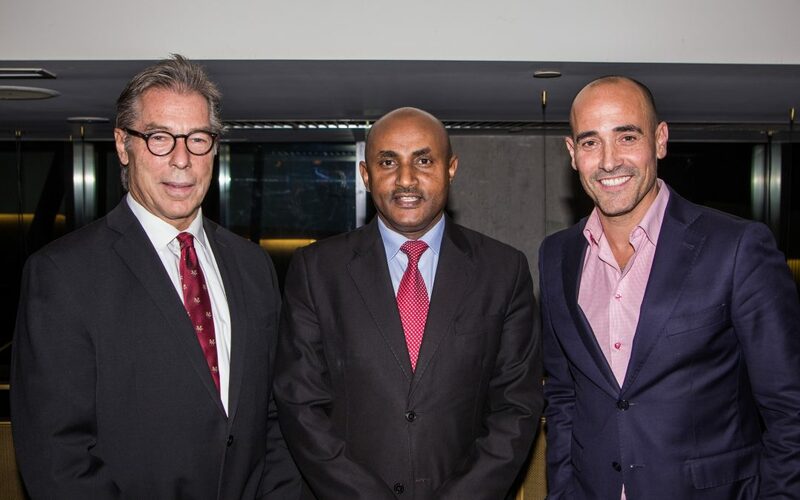 The event gave guests the opportunity to learn more about Ethiopian Airlines and celebrate Rocco’s latest TV series, David Rocco’s Dolce Africa. Which features Rocco exploring both cultural and culinary worlds of Ethiopian, Kenya, Tanzania, Zanzibar and South Africa. “We have been gaining so much attention about the airline over the past few years and hosting fun events like this allows us to engage further. Canadians are taking notice about our airlines and are eager to explore Africa,” said David Timmins Ethiopian Airlines Canada National Sales Manager. Ethiopian Airlines (Ethiopian) is the fastest growing Airline in Africa. In its seven decades of operation, Ethiopian has become one of the continent’s leading carriers, unrivalled in efficiency and operational success. Ethiopian operates the youngest and most modern fleet to 93 international destinations across five continents. Ethiopian fleet includes ultra-modern and environmentally friendly aircraft such as Airbus A350, Boeing 787, Boeing 777-300ER, Boeing 777-200LR, Boeing 777-200 Freighter, Bombardier Q-400 double cabin with an average fleet age of five years. In fact, Ethiopian is the first airline in Africa to own and operate these aircraft. The airlines operates three direct flights weekly from Toronto to Addis Ababa with connections 53 destinations Ethiopian is currently implementing a 15-year strategic plan called Vision 2025 that will see it become the leading aviation group in Africa with seven business centers: Ethiopian Domestic and Regional Airline; Ethiopian International Passenger Airline; Ethiopian Cargo; Ethiopian MRO; Ethiopian Aviation Academy; Ethiopian In-flight Catering Services; and Ethiopian Ground Service. Ethiopian is a multi-award-winning airline registering an average growth of 25% in the past seven years.